Incredibly realistic antique replicas. Indistinguishable from oak. Moulded from original antique oak beams – every detail captured. Cheaper than salvaged antique oak. Won’t move, bow, swell or rot. Handfinished in a variety of finishes. Lightweight and easy to cut for easy, inexpensive installation. Material type: Polymer & Resin Mix. Matching architrave, rail and skirting board available (not shown online). Please call for details. 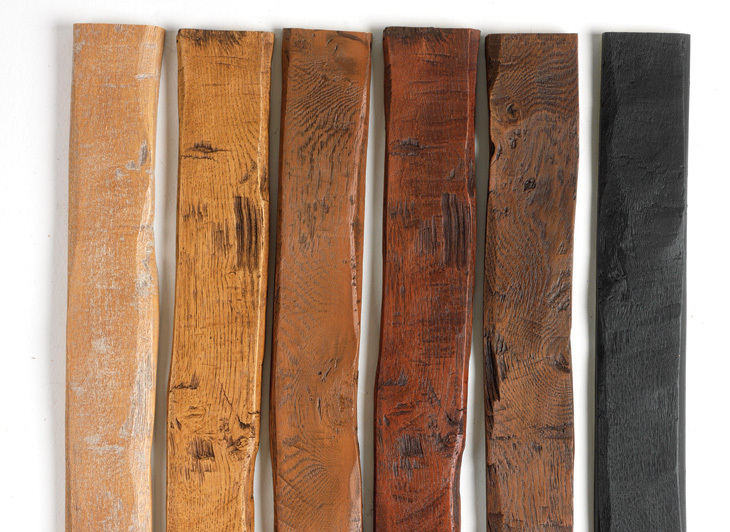 Limed Oak, Mellow Oak, Light Oak, Mahogany, Jacobean Oak, Black. NB. Image looks lighter than actual colours. Use as guide only. If needed, ask for a sample. These products are moulded and hand stained to order. Please allow 28 days for delivery. If you need a quicker delivery, please call and we will try to help you. Deliveries are made on weekdays between 9am and 6pm. With most orders we use a specialist carrier who will contact you to liaise with you about the delivery date. When we use TNT as an alternative, we will contact you to advise delivery date. Please note that surcharges apply to the following postcodes: AB, DD, IV, KW, PA, PH, BA, BH, BN, BR, BS, BT, CT, DA, DT, EX, GU, HS, IM, LD, LL, ME, NR, PL, PO, RH, RG, SA, SN, SO, SP, SY, TA, TN, TQ & TR. Please phone us for a quote. As this range is made to order, unfortunately we cannot accept returns. Please do therefore ensure that you are happy with the product before you order. If you have any queries, please call us.